Gethin was born and brought up in Rhiwbina, Cardiff, and educated at Ysgol Gyfun Rhydfelen and the Universities of Oxford (where he graduated in Philosophy, Politics and Economics and was awarded an M.Phil. in Politics) and Birmingham (where he graduated in Theology). Following internship ministry in Wrexham and a period in London, he was ordained a minister of the United Reformed Church and has served pastorates in Brecon (jointly with the Welsh Independents), Trefforest, Porth and Penrhys (in Llanfair Uniting Church). He and his wife, Dr Fiona Liddell, have also served as Joint Wardens of Coleg Trefeca (Presbyterian Church of Wales) and in 2003-5 he was General Secretary of the Covenanted Churches in Wales and Assistant General Secretary of Cytûn. He started his work as Policy Officer in January 2015 and is pleased to be able to combine in this post his background in both Politics and Theology. 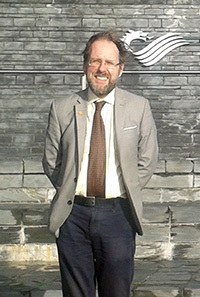 He has a lifelong interest in aspects of the interconnections between Biblical theology and public affairs, and he wrote the chapter on Wales in Belonging to Britain: Christian Perspectives on a Plural Society (Council of Churches for Britain and Ireland, 1991).